This is just too "something" (amazing? coincidental? cosmic? unbelievable? crazy?) not to share. On our first day in our house in East Walnut Hills, we found this nest. 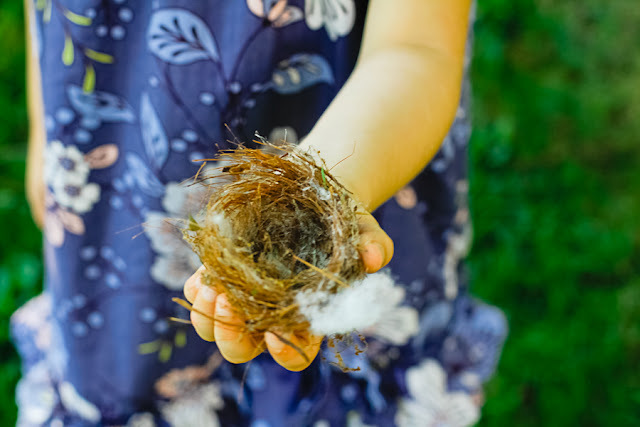 We took it to be a good omen, a symbol of "our new nest," and we photographed it and hung it in our home as a reminder of all that it symbolized. Much later, when Bea was born, the nest took on more significance. On our last day in our new house, Josie found this nest. How cool is that? We still haven't unwrapped the meaning in this moment, but I think it was definitely just a nice way for us to close our last moments in that house. See more on bird symbolism for us here and here.